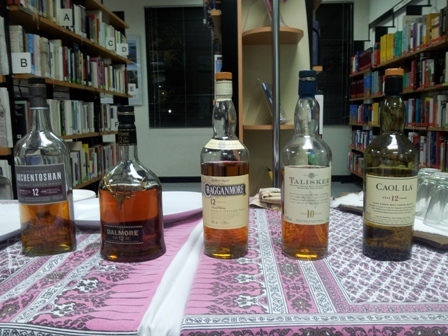 The Goethe Institute in Bangkok invited me to an interesting new format: “a literary whisky tasting”, which I admit I could not resist. About 20 selected invitees followed the invitation and had assembled in the Institutes library for this innovative event. 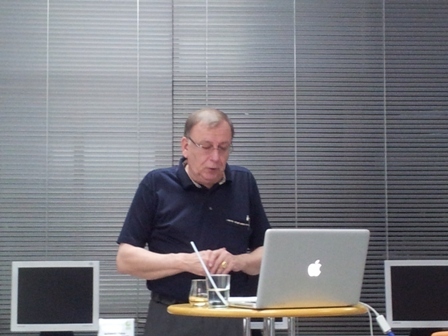 Mr Johannes Scherer from the German stock exchange association of the German book traders (Boersenverein des deutschen Buchhandels) who was in Bangkok for the German photo-book price award exhibition, was the presenter. They all came from a book titled “Aqua Vitae – a literary whisky tasting”. The sequence was as follows: First the art (production process etc.) of making single malts was explained. Then the story was red to us. And finally the specific single malt, his history, the making, and the tasting notes were presented. 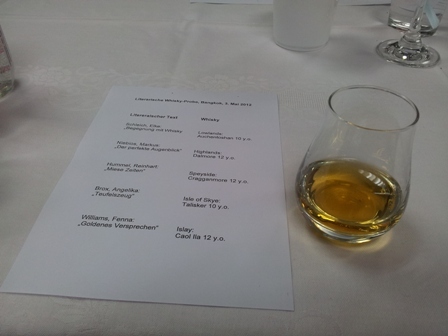 We tasted the single malts together, and exchanged the experience. Questions could be asked, comments shared. Often the specific whisky was part of the short story. I had drunk the last three before (especially Caol Ila). Dalmore I had heard of, and Auchentoshan was completely new to me. We moved from a no-peat content (the first three) to a higher peat content (the last two) so to say. 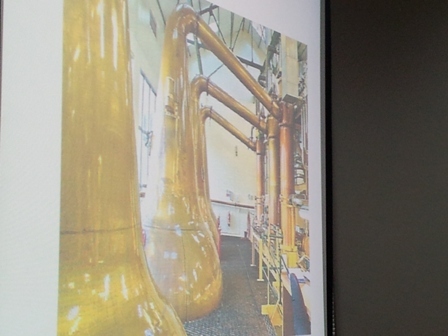 Lots of interesting information about the history of the production of single malts was imparted on us. I loved the tasting notes, I must say – maybe because they reminded me of fine wines? I usually prefer the malts with peat aromas. However, this tasting brought the more subtle ones closer to my heart. This was a great evening. I loved the wonderful atmosphere and the playfulness in the exploration of new “taste territories”. I also enjoyed the stories, some of them funny, some sad, others sombre but always with the bit of wit, some detachment, which allowed them to touch the heart. Thank you Dr. Spitz for inviting me. I am contemplating to copy the format and to set something up on “liberalism and the art of drinking whisky and/or wine”. PS: It turned out that Mr Scherer was a wine connoisseur with a large knowledge about fine wines and an even larger wine cellar. You are currently browsing the The Man from Mosel River blog archives for the day Monday, May 7th, 2012.